If you’ve recently decided to look around for some good quality wooden gates and wondering if it is at all possible to obtain some matching wooden fence panels then the answer is yes! As well as our range of gates and garage doors, which are available made to measure in height and widths, we are also able to offer fence panels to complement our wooden gates. Made to the same high standards people have come to expect from our products, our fence panels are based on a through wedged morticed and tenon jointed frame for strength, which finishes at 58mm ( 2 1/4″) thick. All of our gates are available with fence panels to match and all panels are available made to measure in Scandinavian Redwood (Softwood) and in the Hardwoods, European Oak, Meranti and Idigbo. For a full personalised costing of any of our made to measure fence panels, please contact us with your size requirements. 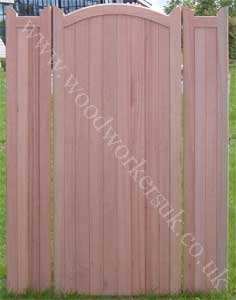 A fence panel is a fence panel? One of our Curved headed gates in Hardwood, with two flanking fence panels. We’ve been told by our customers that to call them ‘fence panels’ is to do them a dis-service! If you’re idea of a fence panel is the typical rough sawn panels available from your local builders merchants then think again! All our fence panels are available in exactly the same quality timbers we make our gates from and all our fence panels are in fact thinner versions of our gates (our gates finish at 70mm thick, fence panels at 58mm thick)! If you’ve seen a gate you like from within our range and are looking for a panel to match then please get in touch. Tailored to your own requirements – Everything we do is made to measure. If you’ve seen a gate from our standard range and it’s not quite what you want then did you know you can customise our gates? To suit all kinds of gate automation – We work with gate automaters throughout the UK, who keep on coming back to us time after time! You can find out why at Gates to suit automation. Close boarded or open boarded – Whats the difference I hear you ask? Please check out our section on open boarded and close boarded gates at Close boarded or open boarded gates. Made bespoke to your own designs – If you’ve got a sketch or drawing that you would like us to take at look for you then please see bespoke wooden gates for more information. Double boarded – Require a gate but don’t want to see the rails on the rear? Then you want a double sided gate!